When building decks using porcelain or concrete pavers over roof decks or other sloping surfaces, at elevations below approx. 1″ (the min. 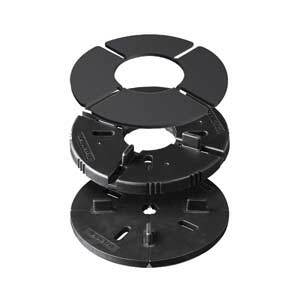 height of the Eterno NM1 pedestal), fixed height rubber support pads are usually the best solution. These pedestal supports are simply placed under each corner of the pavers and stacked on top of each other to the height you require. Inbuilt spacer tabs ensure quick and easy installation and guarantee all pavers are accurately positioned and aligned. Furthermore, you can often avoid the trouble of constructing a restraining barrier around the paved area since the increased friction of rubber inhibits the pavers from moving. 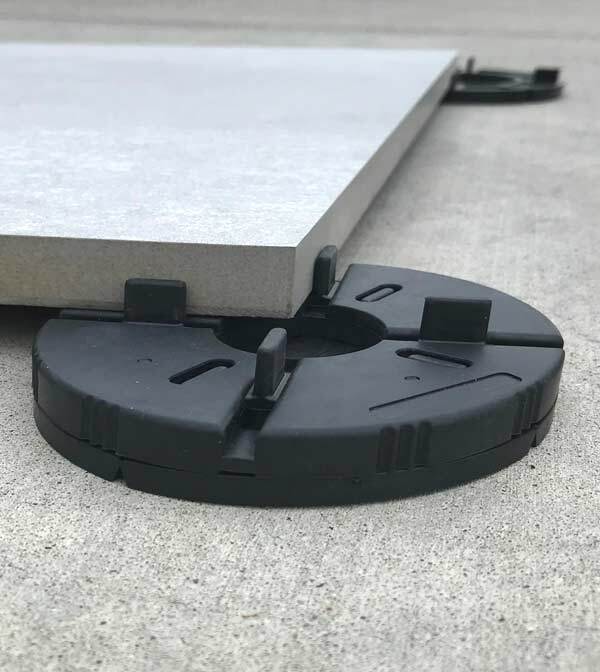 You can start a paver installation with support pads as low as 1/4″ high (giving a finished deck height of just 1″ with a 3/4″ thick porcelain paver) and then stack the rubber pads to a max. height of approx. 1 1/2″ as you move across a sloping surface. 1/16″ or 1/8″ thick rubber shims can be used as well to make minor height adjustments and ensure the pavers don’t rock. When you reach a height of approx. 1 1/2″, you’ll need to switch to adjustable height pedestals if you require extra height for your deck, using either the SE or NM range of Eterno adjustable height pedestals. Samples of our deck support pads are available on request.